DIVISION III SEMI-FINAL: Mayo 2-11 Kerry 0-10 (Thurles, 24/3/1968). MAYO: E Rooney; J Carey, J Fleming, S O’Connor; J Earley, J Morley, J Ryan; PJ Loftus, W Loftus; J Gibbons (1-0), J Corcoran (0-4, three frees), J Langan; J Nealon (0-2), J Farragher (1-2), MJ Ruddy. Sub: S O’Dowd (0-3) for W Loftus. DIVISION III FINAL: Galway 2-11 Mayo 2-5 (Tuam Stadium, 7/4/1968). MAYO: E Rooney; J Carey, J Fleming, S O’Connor; J Earley, J Morley, J Ryan; PJ Loftus, W Loftus; J Gibbons, J Langan, J Corcoran (2-3, 1-3 from frees); W McGee (0-1), J Farragher, J Nealon. Subs: R Prendergast for Carey, S O’Dowd (0-1) for Ryan. SEMI-FINAL: Mayo 1-9 Sligo 0-7 (MacHale Park, 23/6/1968). MAYO: E Rooney; J Carey, R Prendergast, S O’Connor; J Earley, J Morley, M Flatley; PJ Loftus, J Langan; S O’Dowd (0-2), J Corcoran (0-4), P Fitzgerald; W McGee (0-2), M Ruane (1-0), J Nealon (0-1). FINAL: Mayo 2-9 Galway 2-10 (MacHale Park, 21/7/1968). MAYO: E Rooney; J Carey, R Prendergast, S O’Connor; J Earley, J Morley, M Flatley; PJ Loftus, J Langan (1-0, a free); S O’Dowd (0-2, one free), J Farragher (0-1), J Corcoran (0-3, two frees); W McGee (0-1), M Ruane (1-1), J Nealon (0-1). Subs: W Loftus for Earley, T Fitzgerald for Nealon, J Fleming for O’Connor. Mayo 5-7 Clare 0-7 (St Tiernach’s Park, Crossmolina, 20/10/1968). MAYO: M Gallagher; R Prendergast, C Loftus, K Mahon; G Nevin, J Carey, W Loftus; PJ Loftus, J Morley (1-1); S O’Dowd, J Gibbons (1-0), R Niland (0-1); W McGee (0-1), P Hughes (1-2), J Corcoran (2-2). Galway 0-7 Mayo 1-8 (Tuam Stadium, 3/11/1968). MAYO: M Gallagher; R Prendergast, C Loftus, K Jordan; G Nevin, J Carey, W Loftus; PJ Loftus, J Morley; T Fitzgerald (0-1), J Gibbons, R Niland (0-1); S O’Dowd, W McGee (1-0), J Corcoran (0-6, five frees). Subs: J Nealon for O’Dowd, S Hughes for Nevin. Roscommon 1-7 Mayo 2-7 (Strokestown, 10/11/1968). MAYO: M Gallagher; R Prendergast, C Loftus, S Hughes; W loftus, J Carey, K Jordan; PJ Loftus, J Morley; T Fitzgerald, J Gibbons, R Niland (0-2); S O’Dowd (0-1), W McGee (1-0), J Corcoran (1-4). Sub: J Nealon (0-1). SEMI-FINAL: Mayo 3-10 Sligo 0-4 (St Tiernan’s Park, Crossmolina, 26/7/1968). MAYO:E Rooney; S Hughes, C Loftus, K Mahon; G Nevin, T Cafferkey, S O’Grady (0-1); K McNicholas, T Keane; S O’Dowd (0-2), J Gibbons (0-3), T Fitzgerald (1-0); P Kilbane (0-1), W McGee (1-1), D Griffith (1-2). Sub: V Walsh for McNicholas. FINAL: Mayo 1-13 Roscommon 2-3 (Tuam Stadium, 15/8/1968). MAYO: E Rooney; S Hughes, C Loftus, K Mahon; G Nevin, T Cafferkey, J Egan; T Keane, S O’Dowd (0-7); D Griffith (1-2), J Gibbons (0-2), T Fitzgerald (0-1); P Kilbane, W McGee, PJ King. Sub: B O’Reilly (0-1) for Kilbane. SEMI-FINAL: Offaly 3-9 Mayo 2-10 (O’Connor Park, Tullamore, 25/8/1968). MAYO: E Rooney; S Hughes, C Loftus, K Mahon; G Nevin (0-1), T Cafferkey, J Egan; S O’Dowd (0-5, three frees), T Keane; B O’Reilly (1-2), J Gibbons (0-2), T Fitzgerald; PJ King, W McGee (1-0), D Griffith. Subs: F McNicholas for Fitzgerald, J Foody for Rooney, T Fitzgerald for McNicholas. SEMI-FINAL: Sligo 3-5 Mayo 1-7 (Markievicz Park, 5/7/1968). 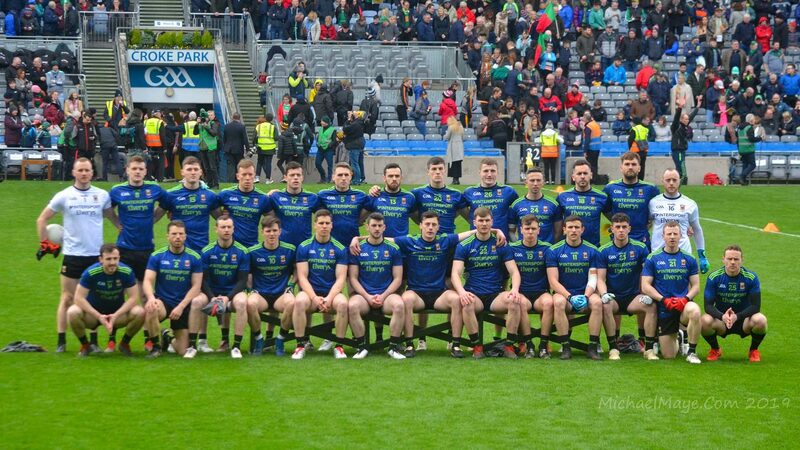 MAYO: P O’Brien; F Hunt, F McGrath, D O’Mahony; M Higgins, T McLoughlin, M Brennan; D Dolan, T Knight; T O’Malley (0-1), D Griffith (0-1), S Kilbride (0-2); F Burns, P Doherty (0-2), M Walsh (1-0). Subs: P Moynihan for Higgins, L McCann (0-1) for Doherty, K Durcan for Dolan.